Wanna see some kewl stuff I used to do? Check this out! 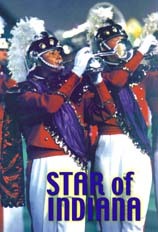 The Star of Indiana Drum and Bugle Corps continues on as the Tony and Emmy award winning Blast! Look for Star and other drum corps tunes on the web. Want to learn more about the marching arts? Check out DCI's web site it ain't about bando geeks.